View or download PDF here now. This compilation of selected writings from Bob Avakian, Chairman of the Revolutionary Communist Party, USA, including excerpts from the Constitution for the New Socialist Republic in North America (Draft Proposal) authored by Bob Avakian and adopted by the Central Committee of the Revolutionary Communist Party, USA brings a truly unique perspective to a subject that is of critical importance for all those concerned with social justice: Constitution, law, and rights. Bob Avakian has spent decades summing up the positive and negative experience of the communist revolution so far and drawing on a broad range of human experience to develop a new synthesis of communism—a vision and strategy for a new and much better society and world. 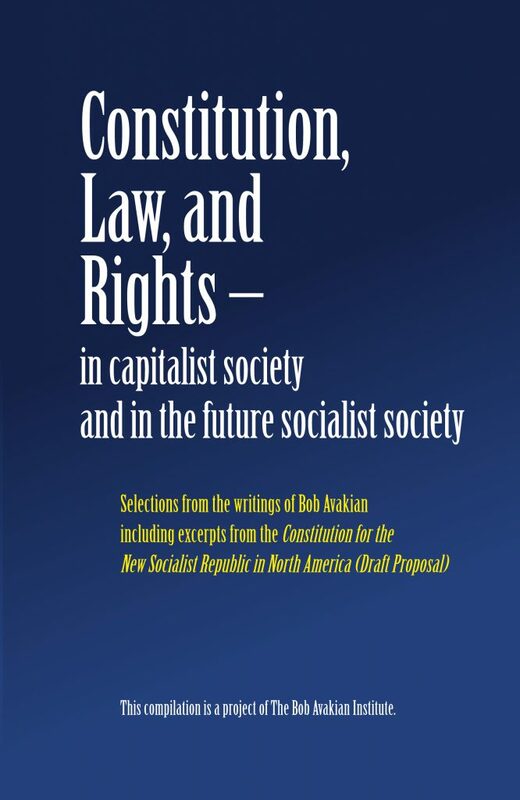 In the writings selected for this compilation, Bob Avakian brings a sweeping sense of history and the development of human society to his analysis of the economic, philosophic, and political underpinnings of the legal system in today’s capitalist society and the role that this legal system plays in reinforcing oppressive and exploitative relations. In comparing and contrasting the concepts of Constitution, law, and rights under both capitalism and socialism, he highlights the profound differences in social content and role. His vision of the legal system and fundamental rights under socialism draws from, but also represents in significant dimensions a radical rupture with, the past historical experience of socialist states in the legal sphere and reflects his reenvisioning of the character of the future socialist society as being qualitatively more lively and vibrant than ever before. The Constitution for the New Socialist Republic in North America (Draft Proposal) is an expression of the new synthesis of communism developed by Bob Avakian; and the excerpts from this Constitution which are included here are an application of this new synthesis to the sphere of law, the legal system, and the rights of the people. It is in the spirit of stimulating serious engagement with the important issues discussed in this compilation that The Bob Avakian Institute is making this pamphlet widely available. The Bob Avakian Institute welcomes your thoughts and comments.